The Architectural Digest Home Design Show www.archdigesthomeshow.com/ took place March 21-25, 2012 at Pier 94 in NYC. The AD show has a "Made" section which showcases individual artists. This is documentation of my booth. Market is residential. Target audience includes designers, consultants, and architects. I made all new work. My strategy was modules, simple geometry, and color blocking. Modules that could be imagined as stand-alones or as groups of 2 or more to run horizontally or vertically, or even as a grid that covers a wall with the same component in variations. 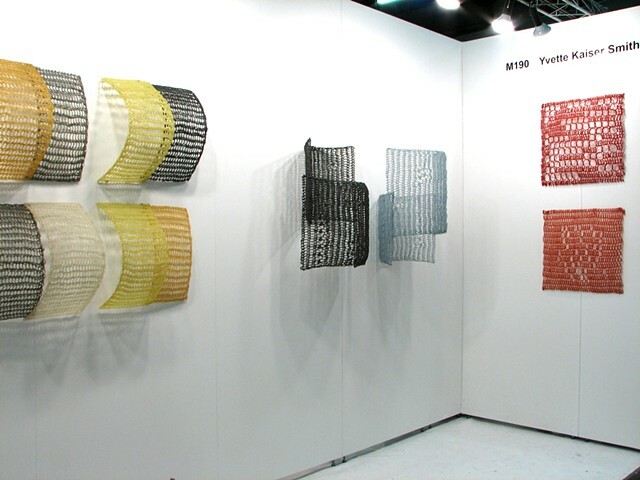 The first 17 images in the Crocheted Fiberglass 2012 pages give detail for this work. yvettekaisersmith.com/section/360744_20?